Every place has its story. Sometimes tragic, sometimes fascinating, sometimes endearing, sometimes a bit of all of these. The fort called Alden Biesen in Bilzen, Belgium, is one of the latter. I say fort – it’s actually a “landscommanderij” (Grand Commandery, pronounced lahnds-commanderay), which is part abbey, part barracks and part castle. Its construction began around 1220 A.D., where it served as the regional seat for the Teutonic Order. This knightly brotherhood was founded in 1190 and remains active to this day. It aided pilgrims on their journey to the holy land, as well as build hospitals and fight in the crusades. At the end of the eighteenth century, French revolutionaries drove the Teutonic Order out of the Grand Commandery, and a few years later the fort was sold to a new private owner, the mayor of the town. Due to lack of funds, the site degenerated and by the end of World War II it was but a shadow of its former self. The last private owner of the Commandery was Armand Roelants du Vivier. He had always been very passionate about the site, proudly giving tours to those who visited, telling tall tales of the site’s turbulent past. By 1971 however, his funds ran dry and he had no choice but to sell to the Belgian government. The members of parliament were not yet fully on board with the idea of spending valuable tax payer money on a run-down fort, however. To give the Belgian ministers a proper welcome on this historic location, he had the fireplaces lit – after all, there’s nothing like a cozy fire to warm the hearts of the MP’s to this place’s enthralling atmosphere. Unfortunately, that’s not all that he warmed up. The chimneys were full of soot, which quickly caught fire. There roofs were very dry, and with no water in the moat to douse the flames, the cozy fire turned into a blazing inferno in a matter of minutes. The flames roared for three days, and when the fire brigade finally gained control of the situation, all of the Grand Commandery’s roofs were destroyed, and the water had damaged the rest. In spite of this disaster, the Belgian government still bought the site and vowed to restore it to its former glory over the following decades. By 2011, most of the site was fully renovated. In 2016, the city of Bilzen obtained some funding to improve tourism in the area. This is where I come in to play my small part in the landcommanderij’s rich history. The city council wanted to submerge visitors in this location’s magic. Working with ACTLD, Alice Events and my employer CREATE, a novel concept came to fruition. Visitors would be welcomed to the site after sunset, and handed a tablet and headphones. An hour long movie is played on the tablet, filmed especially for this attraction. It shows Armand Roelants du Vivier, the Commandery’s last private owner played by Jan Decleir (a famous Belgian actor), as he takes you around the site. The movie starts in the ticket office, and you walk along the fort’s paths together with Roelants du Vivier, as he gives you a tour much like he would have done in the past. You also get to see scenes of the Teutonic knights being called upon by the pope to go on a crusade, a plague doctor passing by, nymphs seducing you with their song, and plenty more. All this is greatly enhanced by a light show which is played synchronously to the movie on the visitors’ tablets. This was also the main technical challenge of this project. 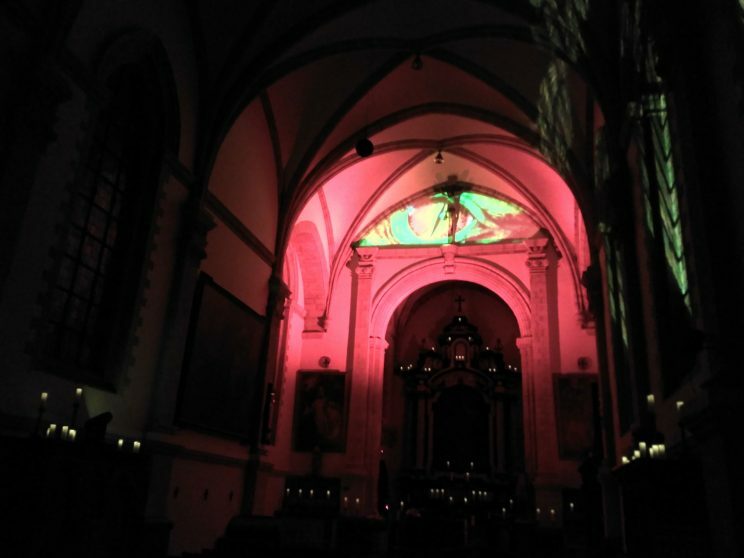 Since each visitor starts the movie in the ticket office whenever she likes and can pause at any time, a way had to be found to synchronize the tablets and the various light spectacles spread around Alden Biesen. We ended up broadcasting the light show’s timecode on the site’s wifi network. The Unity application I wrote to play the videos and show the site’s map also reads this timecode. When the visitor reaches an area with a synchronized show, the timecode is used to tell the visitor how long he or she has to wait before being allowed to enter (with a waiting video to stave off boredom). We spent two weeks on-site to test and get everything just right. Our hard work paid off – there is something quite special about hearing a dragon roar on your tablet, and seeing his eye appear at exactly the same time.